NEW YORK — The day after Thanksgiving it was as though no one had ever eaten a square meal, judging from the lines that formed at Zaro’s Bread Basket or the Little Pie Company or Two Boots Pizza. 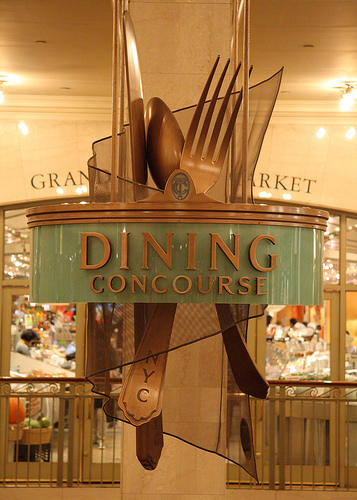 Like everyplace else in midtown Manhattan, the ground floor, the “dining concourse” of Grand Central Station was mobbed. Some of what New York City presents to the world these days is familiar to those of us raised there in the 1960s and 1970s. Men and women, wrapped in cardboard or blanketed in grimy carpeting, huddle against the cold and sleep in doorways. Street vendors, their tables heaped in knock off pocket books and designer watches and gloves and hats, line 34th street where Macy’s is located. The spire atop the Empire State Building is lit in the colors of Christmas. But much about New York is new, like the dining concourse at Grand Central. Many of the roughly 700,000 people who visit Grand Central every day spend at least a few minutes drinking coffee, or eating sushi, or salads, or fresh fruit in the company of hundreds of other New Yorkers. They sit without fear of the stranger. In the 1970s, this airy and classic space beneath the main waiting room, defined by arched entrances and marbled walkways, was a place of gloom and loitering. Working people hurried through — collars up, eyes straight ahead– on their way to meet a commuter train to the suburbs. The great terminal, like the city itself, was a dying place full of decay and crime and fear. Grand Central’s dire condition reflected what happens when a rich nation fueled by cheap energy and a national dream of cars and highways and picket fences, directs its people to seek refuge in its suburbs. 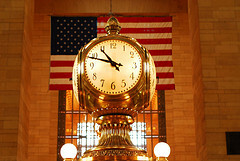 Two generations later Grand Central remains a potent symbol for a way of life that is fast changing again. In an era marked by high energy prices, high land values, growing population density, and remarkable constraints on time, the American Dream looks a lot different than it once did. The old train station as a result is a rare study in how and why people gather in public places in the 21st century, as well as an example of energy and time efficiency, two of the new operating principles of the era. First and foremost, the station is about moving people. Nearly 600 trains depart daily and carry over 500,000 commuters to communities in two states. About a third of that number also find their way into the subway system. Secondly, it is a grand building that fascinates and satisfies. In 1998, the Metropolitan Transportation Authority completed a $259 million renovation that turned Grand Central into a glittering market. Fresh food is a big draw. There’s a market full of good stuff, almost half a dozen fine dining restaurants and bars, nearly a dozen specialty food shops and bakeries, and more than 20 restaurants on the dining concourse. The station has become a destination, even for the commuters who once did nothing more at Grand Central than hurry through. Third, people feel safe because they are. New York City is safer today than almost any big city in the world. According to the New York Times, the city will likely record fewer than 500 murders in 2007, the fewest since record-keeping began in 1963. To date, just 35 of those killings involved assailant and victim who were strangers to each other. The rest were perpetrated by murderers who knew their target. The crowds of people eating lunch at Grand Central are players in a story of a city that cultivates diversity and has found strength in community. That, too, is a new idea.